With a reputation for raucous banter and hearty cooking, the cousins have produced Saporito! which features a mix of traditional and contemporary Italian cooking, including regional specialties. Homestyle recipes drawn from years of cooking with their mothers reflect their love of family as much as their passion for cooking. As busy mums themselves, Daniela and Stefania have adapted their recipes to offer quick, easy and delicious meals for the whole family. The Weekender and UWA Publishing (uwap.com.au) have three copies to give away. Send your name, address and daytime phone number to Saporito! Giveaway, PO Box 885, Joondalup WA 6919 or email weekender@communitynews.com.au. 1 Instructions on how to enter form part of these terms and conditions. If there is any conflict between these terms and conditions and any other published material, these terms and conditions are to prevail. 2 The promoter is Community Newspaper Group Ltd (ABN 13 009 128 081) of 34 Stirling St, Perth Western Australia 6000 (‘CNG’) telephone 9237 1000. 3 Participants in the competition will be deemed to abide by these conditions of entry. 4 Participants agree to make themselves available for publicity purposes. 5 The promoter may appoint judges and the judges’ decision is final. No correspondence will be entered into. 6 Participation is open to residents of the cities of Wanneroo and Joondalup who fulfil the participation requirements. 7 To enter participants must send their name, address and daytime phone number to PO Box 885, Joondalup WA 6919 or email weekender@communitynews.com.au by October 31, 2013. 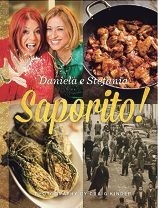 8 The major prize for the competition is a copy of Saporito! valued at $34.99. 9 The winners of the competition will be selected by random on November 1, 2013 at 16 Clarke Crescent, Joondalup. 10 Directors and employees of Community Newspaper Group including their immediate families, its agencies and companies associated with the competition are ineligible to enter. 11 The promoter and the judges will not be liable for any losses or damage whatsoever (including but not limited to direct or consequential loss) or personal injury suffered or sustained, in connection with the promotion, the use of the prize or any act or omission (whether negligent or not) of the promoter, the judges or their respective agents, employees and contractors. 12 A) By entering the competition, you consent to the collection of your details and acknowledge that Community Newspaper Group may, at its discretion, disclose and use these details for the purpose of providing you with goods and services, communicating with you, planning, research, product and business development and sales, promotional or editorial purposes. The details will also be used to investigate complaints, as required or permitted by law, to enable Community Newspaper Group to perform its obligations to you under this or any other agreement and to ensure that you perform your obligations under this or any agreement.